MY SEARCH CONTINUES for sweet potato recipes for the holidays to expand my culinary repertoire for using this vitamin packed and low calorie vegetable. In response to the public’s increasing interest in healthier fare beyond meat and French fries or mashed potatoes, vegetables are showing up more and more on restaurant menus and the sweet potato is one of them. Thank goodness! WE SOMETIMES EAT OUT on Sundays after church. Today, we met our son at Long Horn Steak House for lunch. 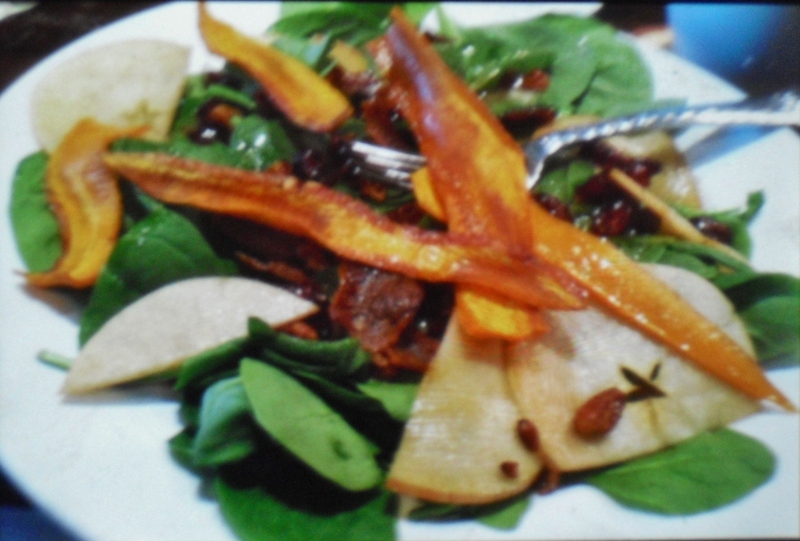 I chose a fabulous salad that would be a nice addition to a holiday lunch: spinach leaves, thinly sliced tart apples, toasted pecans, bacon crumbles, cranraisins, and sweet potato chips, drizzled with balsalmic vinegar. It was delicious – and the sweet potato chips on top added a crunchy flavor to the salad. I FOUND SEVERAL SOURCES for appealing sweet potato recipes that I want to share with you in this Part II post. THE DECEMBER ISSUE of Southern Living (p. 181) has a recipe for sweet potato spoonbread that I am so anxious to try. The first time I ate spoonbread was at my mother-in-law’s house when I was first married. She was an excellent Kentucky cook who served real comfort food. I enjoy all kinds of bread – but this new spoonbread, with a crusty outside and custardy inside, smeared with butter and jam, was a new taste sensation for me. I remember she said she always used Martha White flour and white cornmeal. The sweet potato spoonbread is an old American recipe. English cooks make yorkshire pudding, and American cooks make spoonbread – a recipe dating to Native Americans, some say. IF YOU HAVE A SPECIAL family approved recipe you want to share, I’m interested. So.. A salute to the colorful vegetable that is so good for us.